Home / How to / PC Tips / How to increase the internet speed 10times faster on PC. How to increase the internet speed 10times faster on PC. When we use Windows 7/vista/xp it doesn't give us full bandwidth speed as it has to maintain OS IDLE MODE. This idle mode is also applicable for processor, RAM, Audio & Video processing units to comfort a user but using or applying some tricks we can do it very simply. Today we are going to know how to modify the idle or limit mode of bandwidth without doing any harm to Windows OS. 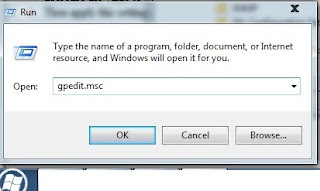 It's a normal trick by using Group Policy Editor or gpedit. 1.Go toStart>runto run a command. 2.In run type gpedit.msc and hit enter or click ok. The Group Policy Editor window will open if you have the sufficient privilege on the computer. 3. In Group Policy Editor window select Computer Configurationin the left side and expand the Administrative Templatearray sign. 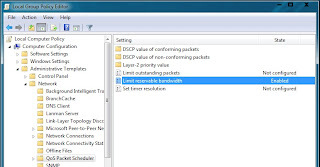 4.Under the Administrative Template expand Networkand select QoS Packet Scheduler. 5. After selecting QoS Packet Scheduler some settings will be shown in the right side and selectLimit reservable bandwidth. 6. To modify this setting double click on Limit reservable bandwidth and get the properties of that. 8. Then apply this setting and complete it clicking ok.
You have to restart your internet connection. That's all. Enjoy a full speed internet connection which is provided by your ISP.